Last week about 150 patients receiving chemotherapy at Fox Chase Cancer Center got a little extra comfort to go with their care. 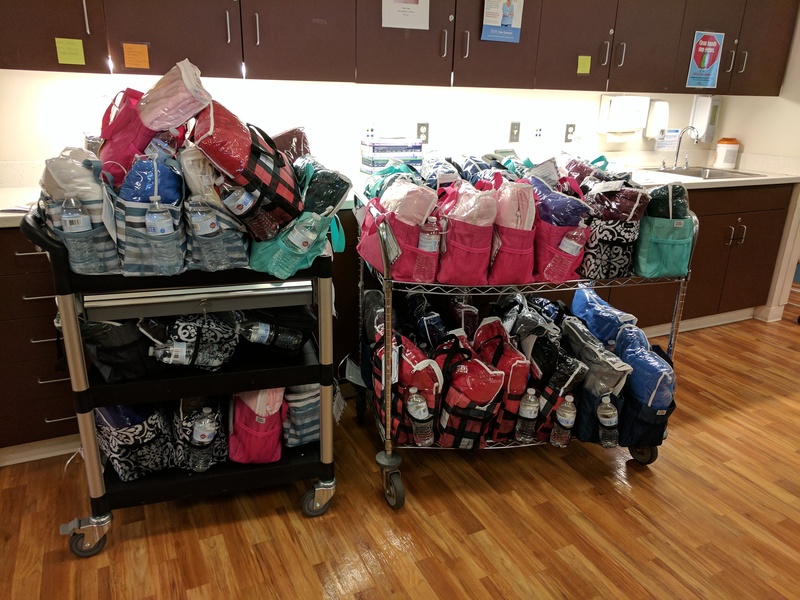 Herk’s Heroes, an advocacy group led by Fox Chase nurse navigator Caryn Vadseth spent several hours distributing Chemo Comfort Bags in the infusion room and the Clinical Research Unit (CRU). Each bag consisted of an All-In Organizer by Thirty-One stuffed with items such as hand lotion, fuzzy socks, hard candy, puzzle books, lip balm, and a blanket. Vadseth got the idea from her father, the late Jerry “Herk” Hertkorn, who was a lung cancer patient at Fox Chase several years ago. He told her about the kindness of a volunteer who used to visit the infusion room and hand out candy every Monday. He said it was a small gesture that had a big impact on him and his fellow patients. After losing her father in 2012 Vadseth founded Herk’s Heroes as a way to keep his legacy alive. To date, the group has raised thousands of dollars for lung cancer advocacy. This is the group’s first initiative that directly touches Fox Chase patients going through cancer treatment. Herk’s Heroes also has participated in the annual Free to Breathe Run/Walk to raise money for lung cancer research. Can a Patient Be Too Old for Stem Cell Transplant?